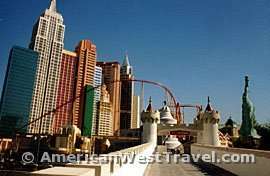 The Las Vegas Strip and downtown Las Vegas have long been the real life make-believe headquarters of the American West, and indeed the world. Millions of visitors come to re-invent themselves if only for a few days and live out their fantasies. The city of Las Vegas is also a master of re-inventing itself and living out its fantasies. When it’s time for something newer and bigger and better, it always happens, and it always will as long as the gambling money rolls in. The Las Vegas hotels and resorts and casinos of the mobster era and Rat-Pack era, as depicted in the movie, Casino , were quaint by today’s standards and except for a handful are largely gone. During the late 1980’s and early 90’s, the popular trend in Las Vegas was towards “family entertainment”. The result was the construction of many “theme” hotels and attractions. The themes ranged from all over the world and covered the past, present, and future. In the rip-roaring 2000’s the super luxurious megaresorts took center stage. Many of these newer resorts continue with world-wide themes. Today’s visitor can truly visit Las Vegas and see the world! Top Deals – Save on Amazing Getaways at Expedia! 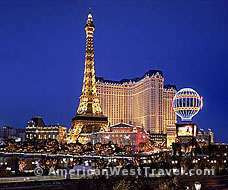 This page presents some of the themes and fantasies of the Las Vegas Strip and its casinos and resorts. 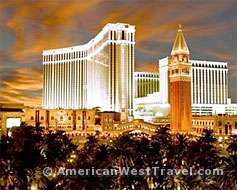 For a full rundown on all the Major Las Vegas Hotels and Resorts, including descriptions, ratings, and reservations, visit our Las Vegas Area Travel Guide. (Click on any hotel picture on this page for more information on the hotel.) Also, be sure to check out our What To See/Do in Las Vegas which features notable attractions and activities (including the quirky and unusual) in the city of Las Vegas. The New York, New York Hotel recreates the skyline and many of the famous landmarks of that city. The different areas of the hotel’s huge casino depict the city’s various neighborhoods. 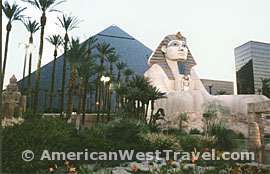 On the other side of Excalibur, you can go backward in time and take a trip to ancient Egypt at the Luxor Hotel. The main building is the giant glass pyramid [photo, right] situated behind a great rendition of the Sphinx. The inside of the pyramid is essentially hollow with the guest rooms against its walls. Rooms are entered by balconies open to the inside. At night, a huge beam of light is projected skyward from the apex of the pyramid, and it is said to be visible from space. 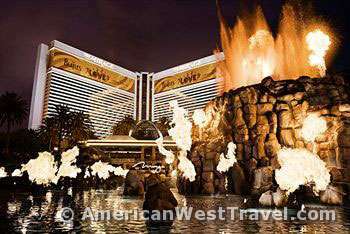 South of the Luxor is the Mandalay Bay Resort and Casino, a highly popular and upscale tropical-themed megaresort featuring an 11 acre tropical lagoon complex that includes the Shark Reef, a fantastic aquarium. 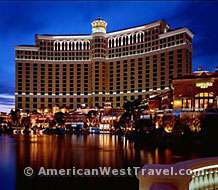 It is also known for its hotel within a hotel, THEHotel at Mandalay Bay. The south end of the Strip also features two Las Vegas classics, the MGM Grand and the Tropicana. The Tropicana dates from 1957 but it is still well-kept and well-received by the public. The central part of the Las Vegas Strip in the area of Flamingo Road features three of the newer super-opulent megaresorts with world-wide themes. [Above. left] The Venetian stands on the site once occupied by the old Sands Hotel and offers close facsimile to the architecture of the Italian city of Venice. It also has its own version of the famous Grand Canal where you may take gondola rides. [Above. center] Paris Las Vegas brings the City of Light to the desert with a 50-story version of the Eiffel Tower and scaled-down versions of other Paris landmarks. [Above. right] The ornate Bellagio is inspired by the northern Italian town of the same name on the shores of Lake Como. It is noted for its 11-acre Lago di Bellagio, a manmade lake with a series of fountains shooting water 200 feet in the air. Caesar’s Palace with its ancient Roman theme has set the Las Vegas standard for opulence since the 1960s. It sits at the northwest corner of Flamingo Road and the Strip. 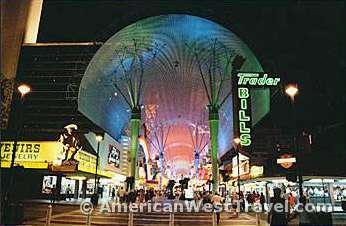 [Above, left] The “Fremont Street Experience” is a highlight of downtown Las Vegas (at the far north end of the Strip). A six block section of Fremont Street has been converted to a car-free, outdoor walking plaza. The canopy is one of the world’s largest video screens extending nearly the full length of the plaza. At the top of every hour, an entertaining audio/video show is presented and lasts about ten minutes. 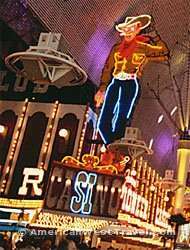 [Above, right] is the famed neon cowboy “Vegas Vic” fronting the Pioneer Casino. The cowboy appears in nearly every Hollywood movie about Las Vegas.